Picture $4 billion worth of cash stacked up in the shape of a train station. 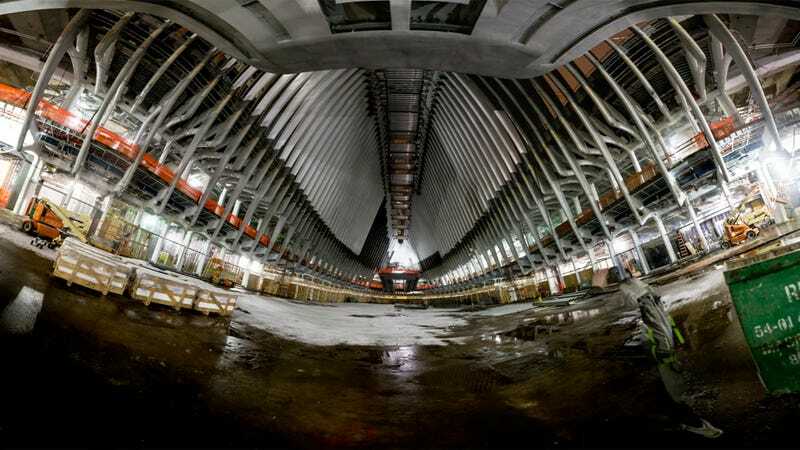 This is pretty much what the World Trade Center Transportation Hub looks like. Except more surreal. You'd also maybe need to throw in a whole bunch of screw ups and missed deadlines, because this alien cathedral of a train station is one expensive mess. Aymann Ismail recently snuck into the never-ending construction project and snapped some of the first ever images of the inside for Animal New York. It looks very cool—though now that the WTC Transportation Hub is expected to cost more than the tower itself, the Santiago Calatrava-designed train station better get a lot cooler. Click through to Animal New York for more images.